Set up ad impression criteria. Autotargeting allows you to display ads in search results without selecting keywords. Yandex.Direct automatically selects keywords for your impressions that match your ad and landing page. A keyword determines which search queries might trigger an ad: these are search queries that contain the entire keyword. Word order, grammatical form, and case (upper/lower) do not matter. Auxiliary parts of speech and pronouns are ignored. For example, if you entered the keyword tours to the moon , the queries buy a tour to the moon and moon tours inexpensive might trigger your ad, but the queries moonwalk tour or tour to Mars will not. You should think about which search terms potential customers might use to find you. The more specific the search term, the closer the user is to purchasing the product. A user who enters journey into space might just want to watch movies or read travel reviews. A user who is looking for tours to the moon has more specific interests. A user who enters buy a tour to the moon is ready to make a purchase. Tip. Keywords can be compiled according to this formula: product description + “selling” words. Click the All regions link and specify the display region for your ads. Enter the keyword and click Submit. Review the list of search queries that match your keyword. If some queries are unsuitable, exclude them by adding negative keywords to your keyword phrase. For example, the search queries American flight to the moon and flight to the moon animation both match the keyword flight to the moon, but they will not result in a tour purchase. To disable impressions for that keyword, change the keyword to flight to the moon -American -animation. Check the number of monthly impressions per keyword. If there are thousands of them, the keyword's meaning is probably too broad. In that case, it is better to choose a more specific one. 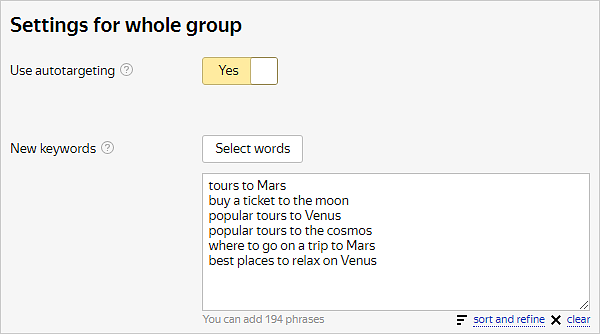 For example, instead of using keywords like ticket reservation, try the keywordbook a ticket on a spacecraft. Add the keywords that you tested successfully to Yandex.Direct.